His first mention in the US media occurred well before he became a leader of the Indian national movement—in The Nation magazine, in 1897. At this stage, John Haynes Holmes had not been to India nor seen the Mahatma. And Gandhi himself never visited America. Yet the pastor’s eulogy was representative. While in India the Mahatma often faced stinging criticism, in the United States he was almost always spoken of with affection and admiration. Time magazine chose him as Man of the Year. The New York Times wrote extensively and appreciatively of the man and his movement. A Christian group in Chicago repeatedly nominated him (alas, unsuccessfully) for a Nobel Peace Prize. 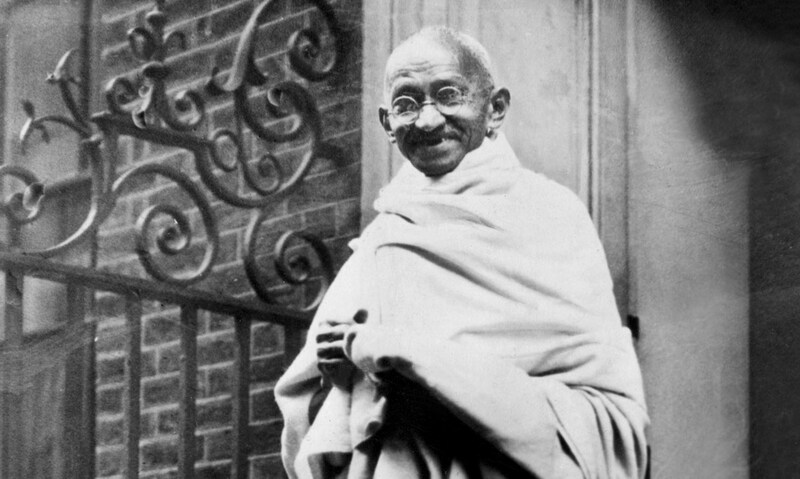 A string of curious Americans, male and female, white and black, went to India to visit Gandhi in his ashram. Between 1920, the year he launched a countrywide struggle for freedom, and 1948, the year of his death, tens of thousands of articles were written about Gandhi in the American press. The fascination with the man—and his methods—has endured long after his death. The great Martin Luther King Jr. read him closely and visited India to study his legacy. Other civil rights leaders were also deeply influenced by Gandhi. The environmental movement often invokes him as an icon. As a lowly state senator in Chicago, Barack Obama had a portrait of Gandhi in his office. Later, after he became president and was asked which person, dead or alive, he would like to have a meal with, he chose Gandhi (adding that it would be a frugal meal). The American obsession with Gandhi has been written about by some fine historians, among then Sudarshan Kapur, Nico Slate and Leonard Gordon. But here I want to report a striking recent finding. The first mention of Gandhi in the American press occurred well before he became a leader of the Indian national movement. And it was printed in this journal, which first wrote about Gandhi when he was a young and struggling lawyer in South Africa’s Natal, and scarcely known in his own homeland. Working in the India Office Collections of the British Library, I came across a clipping from The Nation dated May 6, 1897, titled “East Indians in South Africa.” It was written by “D.B.,” the pseudonym of an Anglo-Irish MP named Alfred Webb, who had a strong interest in Indian affairs. Four months earlier, Gandhi had been attacked by a white mob in Durban, angry that he had criticized, in public and in print, the discrimination faced by his fellow Indians in Natal. He suffered serious injuries, and he may have died had he not been rescued by the (white) superintendent of police. But soon things changed. “Under the stress of the Indian mutiny [of 1857] and the Jamaican rebellion [of 1865], we developed a brutality as great as was ever shown by a civilized people, and which men of the highest culture attempted to justify.” Colony after colony adopted protectionist policies, suppressing native peoples and keeping out colored immigrants. Neither great branch of the English-speaking family can, in truth, plume itself upon its peculiar innate virtues or immunity from failings. At the same time, the Constitution of the United States, with equal laws (broken or outraged, it is true, by sectional prejudices), would appear likely more rapidly to tend towards equal liberty and equal rights than the Constitution of the British Empire, under which imperial prejudices and differences of rights and immunities are sanctioned by unequal laws. The Nation was founded by men who had been in the vanguard of the battle against slavery in the United States, and was hence a natural outlet for an essay on racism elsewhere in the world. This must surely have been the first mention of Gandhi in the American press. The second mention may have been an article published in another newspaper active in the abolitionist movement, the Daily Republican, of Springfield, Massachusetts. It dates from June 1909, when Gandhi was based in Transvaal, where he had courted arrest with hundreds of his followers against discriminatory laws. The Nation of New York and the Daily Republican of Springfield were certainly prescient in their praise of Gandhi and his methods in South Africa. Gandhi himself thought this was but a rehearsal for what would happen in India. Yet it anticipated to a striking degree what was to happen in the United States as well. D.B., writing in 1897, argued that the American Constitution was more likely to produce equal rights than its British counterpart. In the event, it took seventy years, through legislation passed only after concerted struggle by African-Americans on Gandhian lines. Ramachandra GuhaRamachandra Guha’s Gandhi Before India has just been published by Alfred A. Knopf.